Still standing after over one hundred years, Sausalito’s Waldo Point Harbor sits proudly on the San Francisco Bay. It is located off Bridgeway at the north end of Sausalito. Yesterday’s exposed electrical wires and other safety hazards is being replaced with beauty and order. 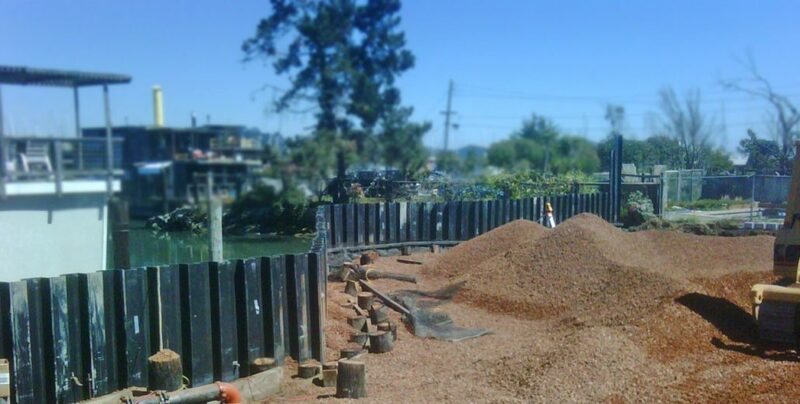 Waldo Point’s Houseboat Community now boasts a new sea wall. The land was raised upwards of 4 feet! There is fresh new paving. Brand new landscaping with grass, well-mulched planter beds and robust perennials. Gardeners’ Guild has been involved in the landscape installation portion of the project over the last few years. Being a part of Waldo Point’s transformation has been immensely gratifying for us. Because of its historic significance we wanted to pass along the story of Waldo Point. Its colorful history and the events leading to its renewal. As of the posting of this blog, the project is in its final phase of completion. The photos below show it in progress. Future updates will include final photos. The houseboat community’s history has been well chronicled Look Magazine, Smithsonian, The New York Times and San Francisco’s local media. Known as a haven for artists and bohemians, Waldo Point’s popularity surged after the WWII and peaked in the 60’s. It was colorful if chaotic. Homes constructed from abandoned boats and shared electricity offered hippie squatters a place to indulge in creative self expression without the constraints of societal norms. Parties were notoriously loud, and the drugs psychedelic. Reality in the form of City Hall – came knocking. 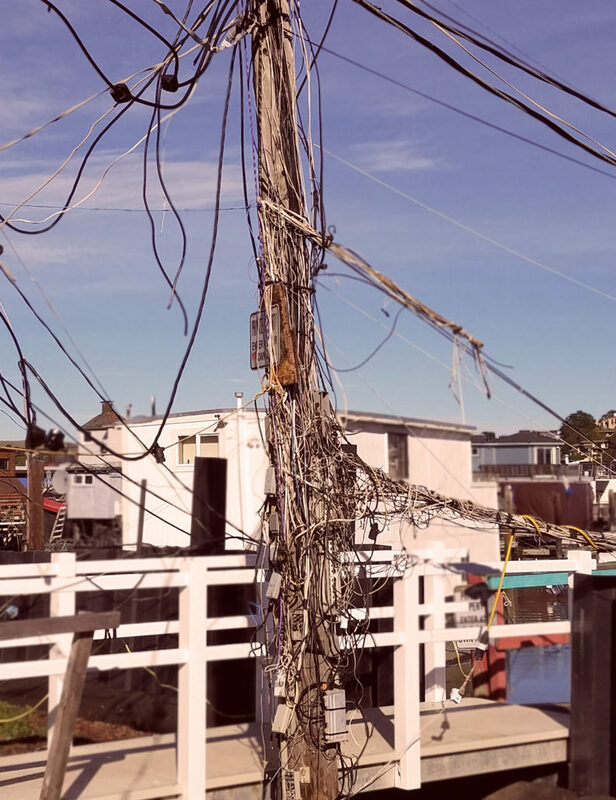 Building code violations, sewage, shared electrical wires and other safety hazards signaled a turning point in the community’s fortunes. City officials ordered the community to invest in repairs. Indignant, the residents were defiant. Bitter clashes ensued. Two long decades would pass before urgently needed remedial work would be approved. And, as time passed Waldo Point’s demographics were quietly changing. By the year 2000, it was a different community that soberly acknowledged their dangerous infrastructure and took action. The newly formed resident’s organization began meeting with local officials and professionals to plan for badly needed improvements. At this point their project was guided by stringent requirements laid out by the Bay Conservation and Development Commission (BCDC). Flooded parking lot at least once a year. See photo above. At times flooding could sometimes flow toward Bridgeway, a main Sausalito artery. The residents wanted trees, plants and grass to soften the look of asphalt. An attractive landscape would provide needed visual interest for both residents and visitors. Will San Francisco's Street Tree Maintenance Timetable Work For You? A Field of Dried Grass & Weeds - Transformed!